Beginning her career in the early nineteen sixties and continuing to perform today, Buffy Sainte-Marie is a brilliant singer-songwriter, multi-instrumentalist, composer, actor, visual artist, scholar and educator. Her songs range in style from folk, pop, soul, roots, rock ‘n roll and protest anthem, and have been covered by numerous artists, from Elvis to David Bowie to Galaxie 500 to Neko Case. Sainte-Marie’s music offers an array of themes –love, addiction, Cripple Creek – and she established herself as a protest singer early on, passionately addressing subjects no one else dared to: advocating for Native American rights, educating people about misrepresentation of Native culture, spotlighting environmental destruction, and calling for an end to war. Buffy Sainte-Marie was born to Cree parents in Saskatchewan, was adopted, and grew up in Maine and Massachusetts. The sense of Maine’s magical landscape comes into Sainte-Marie songs like I’m Going to be a Country Girl Again, and Piney Wood Hills, “I’ll return to the woodlands, I’ll return to the snow, I’ll return to the hills, and the valley below…I grew up on a song there…” Sainte-Marie says that she taught herself piano at an early age and the forest was her refuge. Her voice blows our breezes and makes our eyes well with moon. Sainte-Marie sums up why the military gives us reason to mourn in her song Universal Soldier, the resistance-movement classic written in 1962. In discussing the song, Sainte-Marie said, “we are each responsible – civilians, mothers and sweethearts – so long as we tolerate it” – it is not only the soldier who is complicit, together we allow war to happen. “Universal Soldier” is still applicable today. Youth, particularly the underprivileged, are recruited into being killed and killers at early ages with the promise of money, stature and opportunity. As Sainte-Marie says, we need the peace activist version of west point academy teaching the youth non-violence instead. The power of Buffy Sainte-Marie’s defiance towards injustice was recognized early on by the u.s. government. President Lyndon B Johnson said Sainte-Marie’s music “deserves to be suppressed” and there are letters on LBJ stationary ordering radio stations to ban her music. Sainte-Marie was blacklisted, along with artists like Eartha Kitt and Pete Seeger who protested the Vietnam War. 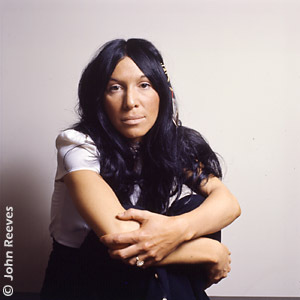 In retrospect, Sainte-Marie reasoned it was the fact she advocates for Native American rights that made her such a threat to the LBJ administration, and speculates that she would have a much wider audience in the u.s. if not for the blacklisting that went on—and that it is a shame to have been silenced because her music is medicine to the people. It is ironic how Sainte-Marie calls out censorship of history in this song, and now, fifty years later, the lyrics are being censored again. Arizona is retrograding with its horrendous policies that try to deny the human rights and existence of brown people – such as making it lawful to interrogate anyone authorities suspect to be an illegal immigrant. Censorship often makes banned materials more prominent and recognized for their quality art and truth – the suppressed surfaces stronger than before. Hopefully more people than ever will now be reading Rethinking Columbus, which includes other important authors such as Leslie Marmon Silko, Joy Harjo, Martin Espada, and Eduardo Galeano. Buffy Sainte-Marie’s song-writing ability is unmatched – her lyrics are rhythmic poetry and speak universal truths. When using her talents to protest war and injustice – Sainte-Marie is powerful and effective, bringing chant-pop momentum to carry audiences towards justice. The desolation of this scene still rings true today: environmental destruction, being sold out for corporate interest, tribal lands being poisoned, destruction of amazon rain forests and peoples – the list of murders for profit goes on. The Sainte-Marie song “Bury My Heart at Wounded Knee” is a rock-roots ballad that fiercely challenges the injustice enacted against Native people since colonizers first set foot on America, still going on today. In the song, Sainte-Marie references the tragic story of her friend and comrade, the Micmac AIM leader Anna Mae Aquash. These lyrics sum up the twisted foul play the u.s. government sanctioned in the murder and murder-cover up of Anna Mae Aquash—a mother and active AIM member who stood up for her people and land. Anna Mae Aquash has become a symbol of strength and courage, and of all the wrong enacted against Native people. Sainte-Marie praises the intrinsic genius of being harmonious – taking care of one another and the earth and realizing there’s enough for all if we’re not greedy. Buffy Sainte-Marie is an example to us. She’s dedicated her life to justice, pacifism, art, and being a good person – remaining beautiful and defiant as ever in her elder years – her roots are strong and deep . I am proud that she grew up in Maine – that this place is of her – giving balm to the soul of the world. to retired people, I read the lyrics to two of buffy’s songs “universal soldier” and “until it’s time for you to go”. these folks really like what she has to say. is there a book containing the lyrics to all of her songs?